You will need to pinch yourself to see if you're dreaming while visiting Hallstatt, Austria — Trust me, you're not dreaming but it really will feel like a fairytale! Interested in seeing the best of Europe? For those who have been to Hallstatt, Austria, you know how easy it is to instantly fall in love. The colorful houses are stacked on the side of the mountain next to a beautiful waterfall, the city is full of yummy cafes, cute little boats and all of this is situated on a seriously gorgeous lake — Yep, welcome to Hallstatt, Austria. It's an absolute dream. 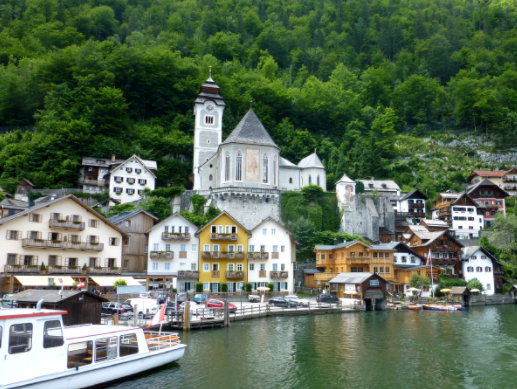 No wonder our ILP volunteers living in Europe choose to spend some vacation days in Hallstatt! This is a dreamy day trip from either one of these big cities in Austria, and you can easily fill an afternoon (or two) with our favorite adventures). For 20 Euros (about $23) you can rent a cutie little electric boat to cruise around the lake in. The boat only goes about 2mph but the views you get from the water are unbeatable and gives you a really neat perspective of the quaint village. Plus, 20 Euros split between a few of you in your ILP group isn't too bad at all! There are also cheaper boats you can rent. Electric ones are the most expensive (17 or 20 Euro per hour) but there are also Swan paddle boats (15 Euro for an hour), Rowing boats (11 Euro for an hour) and Stand Up Paddleboards (15 Euro per hour). 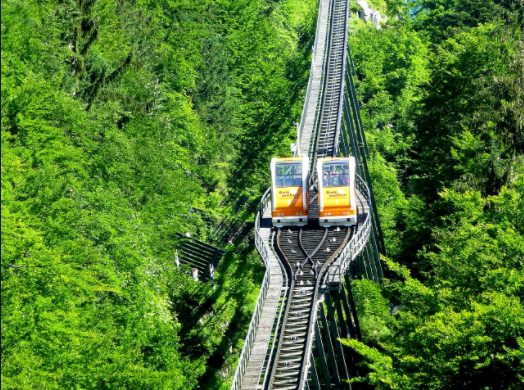 Maybe I'm like a little kid, but I still think funiculars are so cool! Ride the funicular up the mountain to the Hallein Salt Mines. Not only is it fun but it will save you an hour hike up the mountain. From there you can go underground and walk through the tunnels and rooms. You can even visit the underground lake (okay, awesome!! ), take the slide down deeper into the mine, or ride the miner's train. Block out 3-4 hours for this activity. Buy tickets online (looks like a roundtrip funicular ticket and a ticket to the mine is about 30 Euros). The actual mine is a bit outside of the city of Hallstatt, so you'll need to arrange transportation. If you book a tour, that is probably included, or you can book a train ticket to get you from Hallstatt to Hallein. Or you can visit the mines in Hallstatt itself; there is no funicular, but there is a cable car ride you can take. Price is the same - 30 Euros. Get availability and other details here. Hallstatt has some beautiful hikes that can take you around the lake and through the mountains. A recommended one would be The Salt Brine Trail. This can be reached by taking the funicular up the mountain. Instead of taking the funicular down you can hike this trail down. This hike will take you right passed the Mühlbach (Millbrook Waterfall ) back to the heart of town. Another hike is the Panorama Trail. This is more of a leisurely walk than a hike. The trail starts behind the cemetery at the Catholic church. Take a few steps onto the forest road and you will have amazing views as you take this hike. At the bridge to the Mühlbach the road will change to asphalt and will lead you back down a small hill the the bottom of the mountain. Market Square is the center of town and something you will definitely stumble upon. Full of cafes and shops it is a nice place to explore and pick up souvenirs. 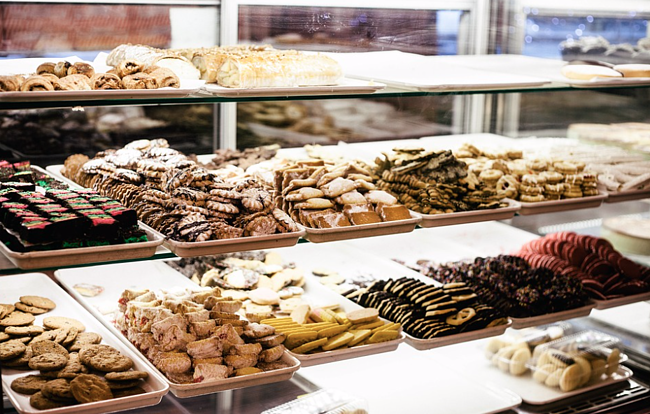 Throughout the year they have different events like Christmas markets, concerts and other holiday celebrations. I could sit here for hours and people watch! 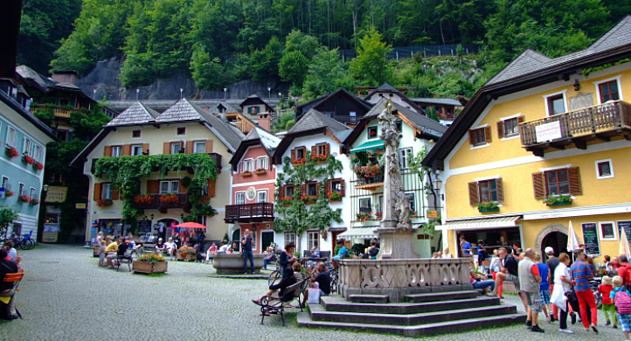 Check out the World Heritage museum to learn more about the history of Hallstatt. Starting from the Stone Age and ending at present day you can learn all about the city's history, Salt Mines and cemeteries. *The museum has been open since 1888 even that on its own is a piece of history! 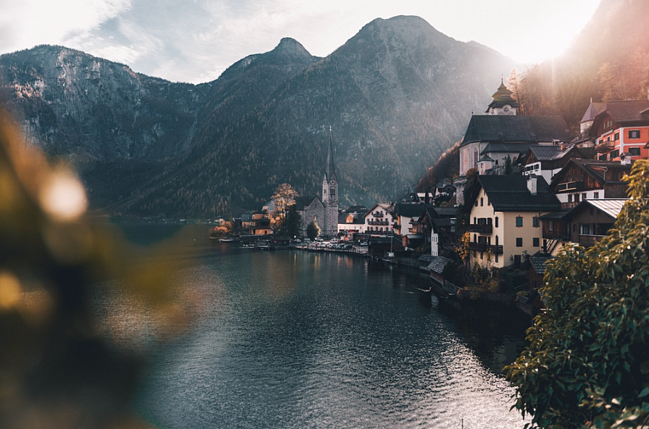 Hallstatt is a little town perched atop a little hill, surrounded by a lake (this doesn't sound like real life, but it is). This little spot in Austria is easily accessible from other cities; in fact, you can get day trips from Vienna to Hallstatt if you'd like (Get more info about Vienna here). If you're taking a train between Salzburg and Vienna (we suggest seeing both of these cities!) you can easily stop off and spend a day in Hallstatt. You'll need to book a train ticket here, then get off at the Attnang-Puchheim stop. Then you'll take another train or bus towards Bad Ischl and Obertraun. Once you arrive at the Hallstatt station, (it's south of Bad Ischl and one stop north of Obertraun) you'll disembark to find a boat dock next to the train tracks. The ride from Attnang-Punchheim is about an hour. Then, a regular ferry will take you over to the actual town. Here are directions on how to get to Hallstatt via Vienna and via Salzburg. Ready to visit amazing places like Hallstatt? 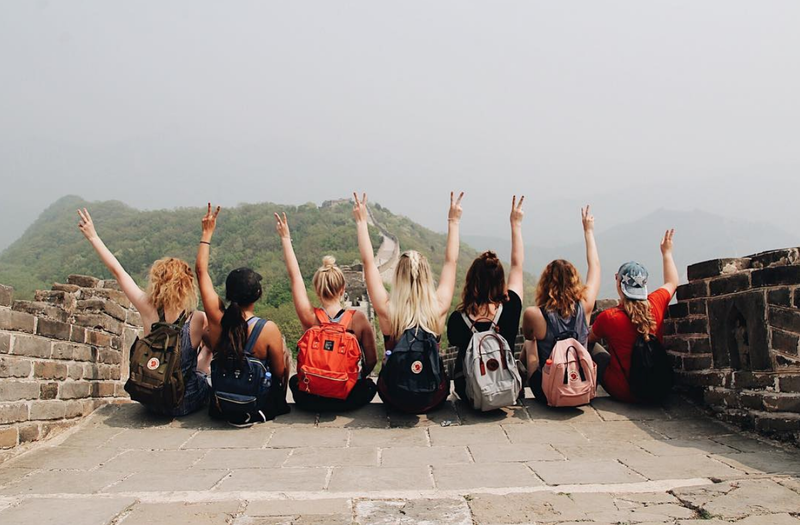 Spend a semester volunteering in Europe! Whether you end up volunteering in Ukraine or Romania or one of ILP's other European countries you really can't go wrong. Click the button below to talk to a rep in the office and learn more about European countries you can volunteer in!